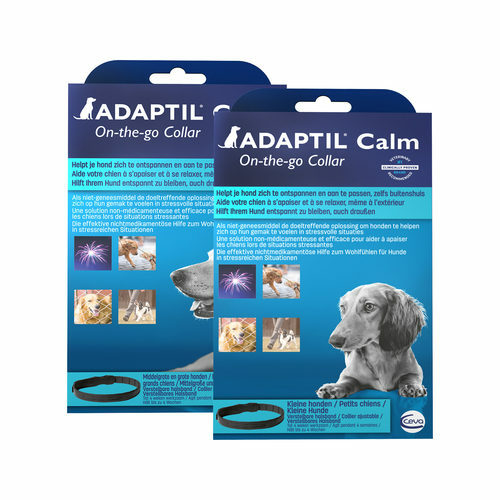 Adaptil Calm Collar (formerly known as DAP) is a safe and effective product that uses pheromones for the treatment of stress, anxiety and unwanted behaviour in puppies and adult dogs. Dogs can suffer from stress and anxiety, which may result in them behaving badly: excessive barking, whining, destructiveness, uncleanliness and excessive licking. You can find out more information here on anxiety, stress and unwanted behaviour here. In some situations, it is important that the dog is helped to get rid of the fear or anxiety, or at least to help it feel better. Adaptil Collar offers a solution! When females lactate, they release appeasing pheromones. These have a soothing, calming effect on their puppies. Research has shown that these same pheromones work on adult dogs too. Adaptil products contain a synthetic analog of these appeasing dog pheromones. This product is very easy to use and should be worn by your dog in the same way as a flea or tick collar. The dog's body temperature heats up the collar, causing the pheromones to be released and permeate into the dog's immediate environment. Since warmth is the essential for its effectiveness, it is important that the collar has a snug fit. If the collar is too loose, it may not transfer enough heat from your animal and will not have the desired effect. Under ideal conditions, the Adaptil Collar can last for up to 4 weeks. It is recommended that this product is used for 3 to 4 weeks for optimal results. Outdoor stressors such as traffic, other dogs, thunderstorms, fireworks, etc. If your dog seems stressed, anxious or shows unwanted behaviour inside as well as outside, we recommend the Adaptil Collar to be used in combination with the Adaptil diffuser. Adaptil is not just available as a dog collar, the same formula of synthetic pheromones can also be purchased as Adaptil spray or Adaptil tablets. The table shown below suggests which of these products is best for each given situation. The Adaptil collar S-M (45 cm) is suitable for puppies and small dogs with a neck circumference of up to 37.5 cm. The Adaptil collar M-L (70 cm) is suitable for medium and large dogs with a neck circumference of up to 62.5 cm. Have you used Adaptil Calm Collar before? Let us know what you think about this product. Works very well to provide him with his comfort zone, both inside and outside. Worked well for our border collie. I do think the effect really depends on each individual dog though.